You have just bought six acres of land, right on the beach, close to Brisbane. You are thinking of building your dream home there. And because you run a very successful business, you are thinking big. Think three levels, four bedrooms, five bathrooms, three spa baths, huge lounge/dining area, spacious kitchen/bar, home theatre, gym, offices (two offices – one for the kids) plus two double garages and a couple of single garages. The Stramit® steel roof is a major design feature of the house. Although little of the roof is visible from the ground, the house is nevertheless a dramatic example of the flexibility of metal roofing, since the roof lines could not be realised in any other material. Traditional Stramit® Corrugated cladding was used for the pitched roofs. All roofing, guttering and fascia was rolled from Colorbond Ultra coated steel for added protection against the corrosive salt air. The roof sheeting is light-coloured (Dune) to reflect heat, with guttering to match, and Surfmist fascia to provide a subtle contrast. 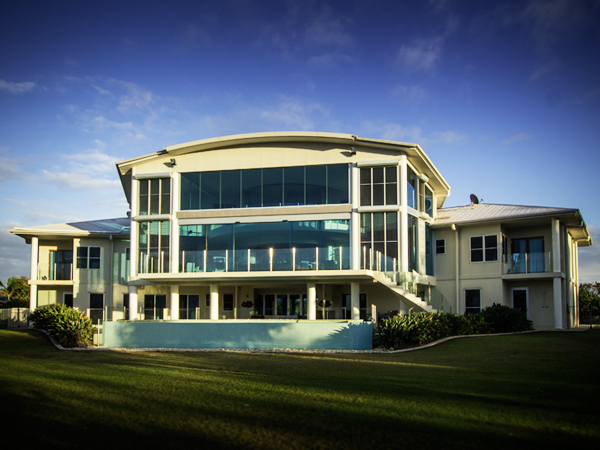 The striking design and quality finishes of the house were recognised by the Master Builders Association of Queensland, who named it House of the Year at the MBA 2007 Brisbane Housing & Construction Awards.